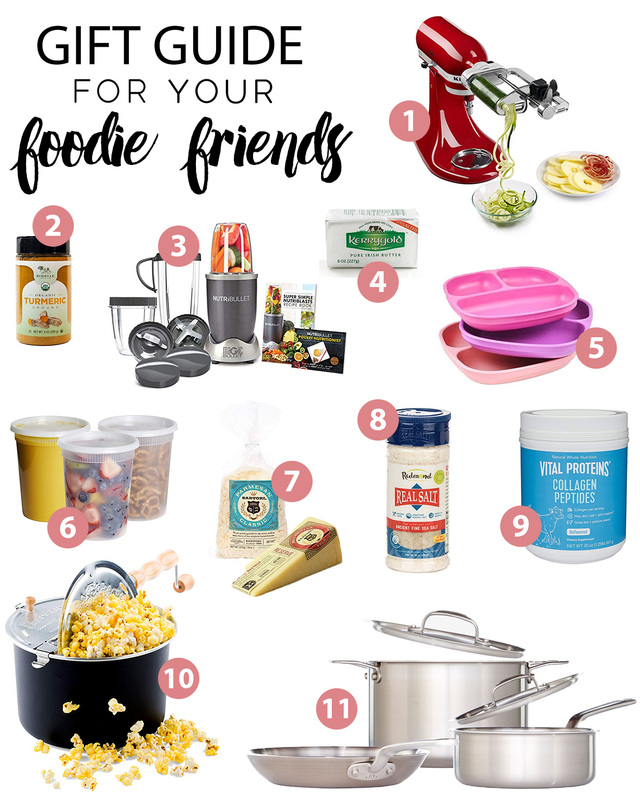 I wanted to share some of our favorite kitchen products / food items / essentials. This is not sponsored, all thoughts are our own + we just want you to enjoy the kitchen and cooking as much as we do. And this is some of the stuff that has grown our love of cooking together. spiralizer – Forrest’s grandmother gifted us a Kitchen Aid spiralizer attachment several years ago before it was “cool”, and that thing gets so much use in our home! We make zucchini pasta at least one night a week and this makes it so quick + easy. TURMERIC. talk about another food item we add to just about everything we consume. We started adding organic turmeric to our food because of the anti inflammatory elements it provides. And now, we add it to everything we cook. a reliable blender. I am highlighting this I love the convenience of it. It is portable, easy to use, wash, and make individual portions. We use our NutriBullet every single morning to blend our bulletproof coffee. grass fed butter – I never knew the difference grass fed butter would make. Especially since Forrest and I are almost at our one year mark of being on the keto diet. We put kerry gold butter in our coffee every single morning. We even pack it with us on road trips. these are the only plates we use for our girls – we love replay! We have their bowls, plates, cups, snack cups, etc. They are such high quality and have really great color options. We have the sorbet collection. I especially love the divided plate – it makes preparing their food so easy. deli containers!! I can not emphasize these enough. We use them daily. We love to put our homemade broth in them, set them cool, and then stick them in the fridge until we use it later that week. cheeeeeese 🙂 sartori cheese is our life. They have several types of cheese and we like every single one. Our girls also down it! We buy ours at our local Wegmans and I don’t think I could ever go back to store brand cheese. REAL salt – this is huge! We add salt to all our dishes and the kind of salt plays such a big role. This is a brand we know and love. COLLAGEN! it would be safe to say that we add collagen to just about everything we eat/drink. We put a scoop in our morning coffee, add it to soups, smoothies, etc. whirley pop popcorn maker! we originally got our whirleypop for an engagement or wedding gift (we can’t remember which), but it is still, to date, on of our most used kitchen items. We make popcorn almost nightly. We love it so much, we have bought several people them as gifts. made in cookware – pots and pans (and knives) are soo important in the kitchen. Forrest and i have always thought it was more important to have 1 solid frying pan, and 1 solid pot and thats pretty much all we use. It is so worth the investment because you’re paying for quality and a lifetime of use.